colour design @ �4.99 each. Sold as a single decal sticker and not a pair so you can purchase as many as you require, please check the size. The letters are pre-spaced on a carrier sheet with release liner for quick and easy application. You also receive an applicator and instructions included in the Postage & Packing. We are selling viny cut decals only and not the calipers, you have to paint your vehicles brake calipers before applying. 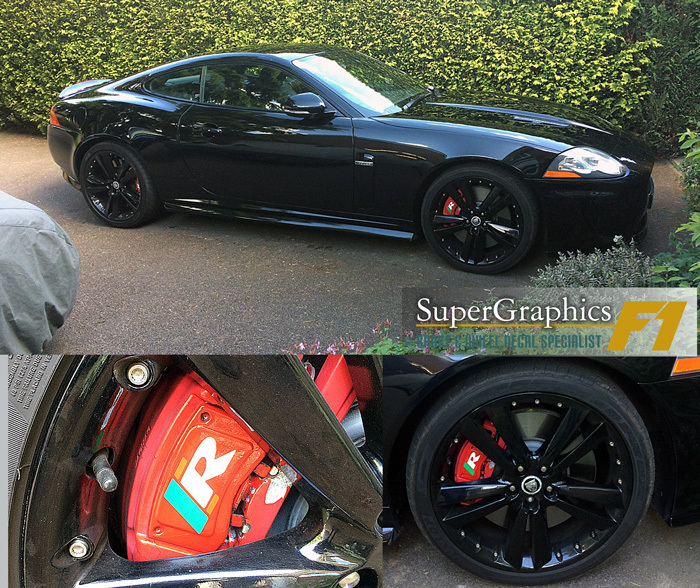 These decals should last forever, it�s the caliper that will normally need replacing before the vinyl does. Shopping Note: Please add your choice to your shopping Cart, when you are ready view your shopping Cart and add the number you require per item. You will be able to continual shopping after you have updated your shopping cart if you wish. 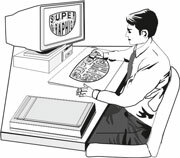 This website is protected 100% by a secure connection using supergraphics servers which cannot be hacked like third party servers with remote access. Our servers do not have remote access (http acccess) so there is no way in, this is not rocket science. SECURE SOCKET LAYER. When your ready to purchase you will be redirected to the paypal secure website. 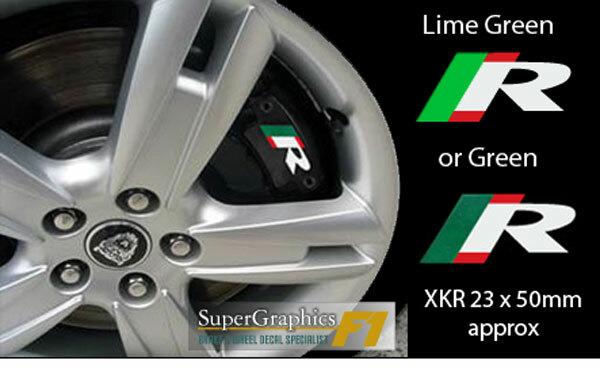 Do you require a bespoke brake or wheel decal sticker, are you looking to restore a damaged wheel or brake caliper back to its former glory when an original replacement is not available, we can help. 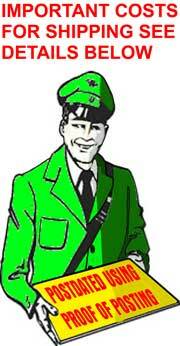 The default postage service is Standard 1st class UK and 1st class Worldwide air mail. If you require signed for delivery there is an additional cost of £6.55. We have found the standard postage service to be faster than signed for in nine out of ten cases, it appears that custom checks hold up delivery. All delivery times can vary so please allow 3-30 days for UK and Europe with 15 - 60 days for Worldwide. 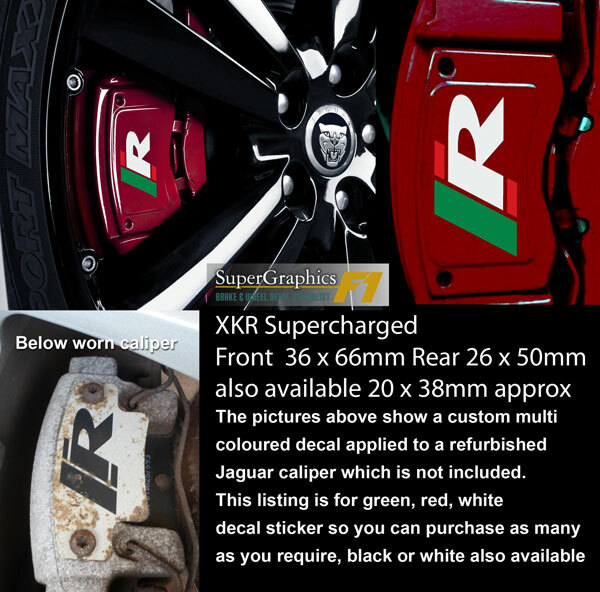 Brake decal sticker to restore Jaguar XKR supercharged brake calipers @ �4.99 each. Sold as single decals and not pairs so you can purchase as many as you require, please check the size. They are Die cut out letters pre-spaced so the proportion stays exactly the same. All sized�to fit Brembo brake calipers for the front or rear brakes. We are selling the Brembo die cut vinyl decals only and not the calipers, you have to paint your vehicles brake calipers�before applying. Each colour is spot printed for ultimate colour fidelity these are not cheap inkjet or similar prints. We make the worlds best printed stickers made using Ultra premium 3M vinyl so you can apply over curves and rivets like a pro, you can also finish with clear coat just like the original. Full application instructions are included so you can also apply like a pro. 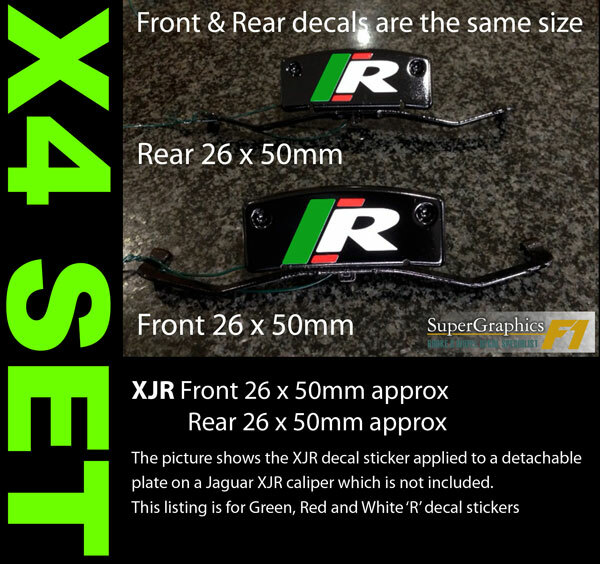 Brake decal sticker to restore or repair Jaguar XJR supercharged brake calipers @ �4.99 each. Sold as a single decal, not pairs so you can purchase as many as you require, please check the size. The Decal cut out letters pre-spaced so the proportion stays exactly the same. 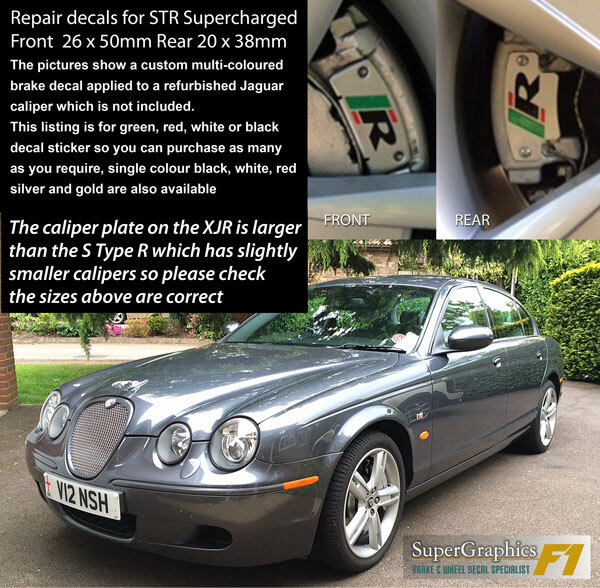 All sized�to fit Jaguar brake calipers for the front or rear brakes, please check the sizes for fitment. 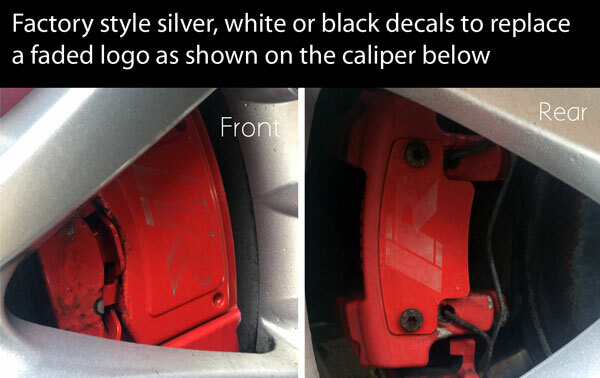 We are selling die cut vinyl decals only and not the calipers, you have to paint your vehicles brake calipers�before applying. colour design @ �19.99 set.